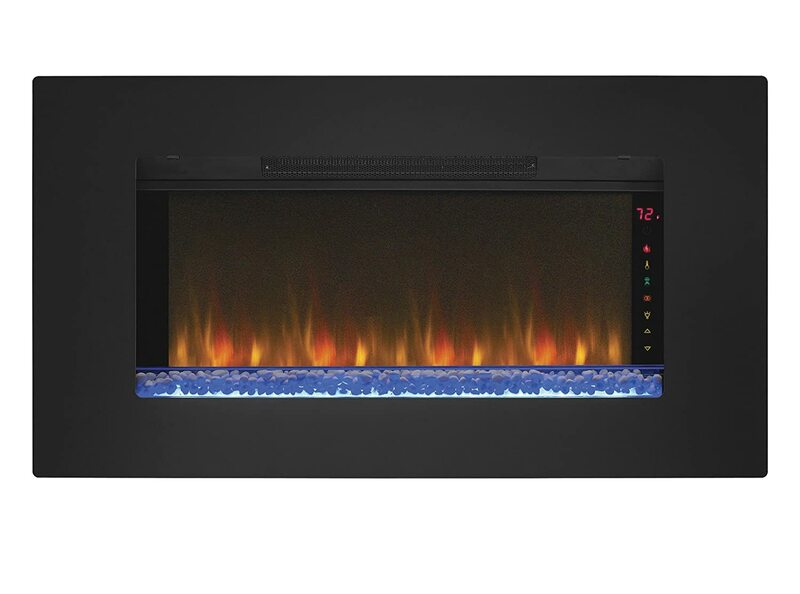 Are you wondering how difficult it is to install a wall mount electric fireplace? Spoiler Alert: It is a very easy project and can be done in under a half hour. The installation process is very easy and it is very similar to hanging a heavy mirror or picture frame. Instead of looping wire over screws, you will be installing a mounting bracket that the firebox will then attach to. One consideration to look at carefully is the location of the outlet and cord. You may want to move the outlet in the wall so that the cord is hidden behind it, That may be a task beyond the average home owner. In the first video below they show a clever way of camouflaging or hiding the cord with a little table and flowers. You may want to consider paint-able wire covers. These can hide the cord and the cover can be painted the same color as your walls. This is a cheap and effective solution. Naturally, each individual wall mount electric fireplace will have its own unique installation instructions. But in general, the methodology is the same for all of them. Step 1: attach the mounting bracket to the wall. Step 2: attach the firebox to the mounting bracket. Step 3: attach the screen to the firebox. 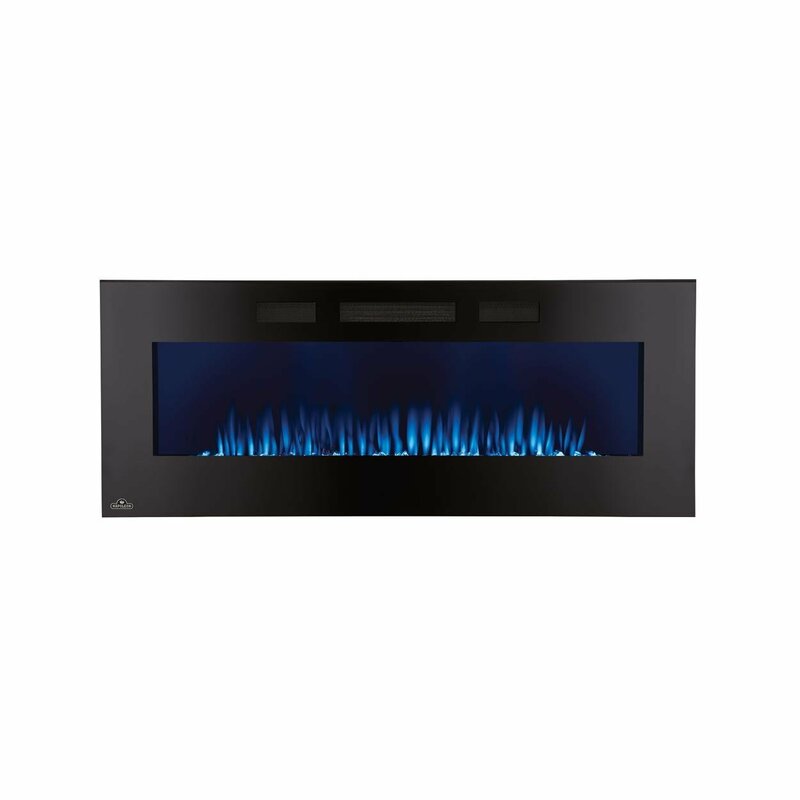 Most electric fireplaces are shipped in two separate boxes one contains the flame effect screen, and the other contains the firebox and mounting hardware. Depending on the model you have, the instructions may tell you to attach the screen to the firebox and mount that combined unit to the mounting bracket. ideally you want to mount the bracket into wall studs. If this is so, it is vitally important never to lift the fireplace by the glass screen as you can pull it right off. Always lift the unit by the firebox. If you can’t quite get your arms around it have someone help you. Here is a great video that clearly illustrates how to attach the mounting bracket to the wall. 1. In the video, he has already located the studs by tapping and listening for a solid sound. We recommend the use of a stud finder, which is a $10 tool that has a little magnet in it. You move the stud finder across the wall horizontally and when it senses a nail you have located a stud. The next stud should be about 16” to the right or left. 2. Before making holes in your wall, use the carpenters’ level to make sure the mounting bracket is level. If is off just a little, when you hang the large fireplace the tilt will be magnified. Measure and level twice before committing to drilling holes. 3. It is important to make sure the mounting bracket is secured to the studs for maximum strength. If you have located the studs and they are spaced so they do not match up with the mounting bracket, secure one end into a stud. The mismatched end of the bracket can be secured to the wall using an anchor bolt. Make sure the anchor bolt is rated to carry the weight of the fireplace. If you want to install your wall mounted electric fireplace into brick or masonry you’ll need some additional hardware beyond what is included in the standard installation kit provided with your unit. You will be using anchor bolts, but they are Masonry bolts. These are distinctly different from drywall anchor bolts. It may be possible to simply substitute the masonry anchors for the screws provided by the manufacturer in your kit. Chances are though the diameter of the holes in the mounting bracket might be different from the width of the anchor bolt. There are two solutions, one is to drill out the size of the whole in the mounting bracket or use the anchor bolt to secure a piece of wood to the brick or masonry and then mount the bracket to the wood. This video clearly shows the latter technique. There is an alternative method for attaching the mounting bracket and hardware to brick or masonry. The catch with this is you need a hammer drill which is a specialized tool. If you don’t have one they can be inexpensively rented. Though at first thought the mechanics of how to install a wall mount electric fireplace may seem daunting and overwhelming, the actual truth is that it isn’t. Basic installation is very easy in 99 out of a hundred cases. We hope this article took some of the fear out of tackling this relatively simple process. Don’t let installation prevent you from getting cozy by the fire. For fires with the vent at the bottom, what’s the recommended height between floor and the vent? I ask because the one we have fitted doesn’t say and whilst we thought it was high enough from the floor, the heat has split my laminate at the seams directly under the vent and loosened/discoloured the skirting board. On wall mount fireplaces one manufacturer reccomends 3 feet of clearance above electronics. I would think that would work for floors too. though I don’t understand mounting it close enough to a floor to cause damage. One solution a reader had was to install a ‘floating shelf’ between the fireplace and TV. It acted as a deflector.